I Was Injured in an Elevator. Can I Recover in Louisiana? When you think about an elevator accident, the first images that leap to mind may be of an elevator stuck between floors or an elevator car that suddenly plummets several floors. 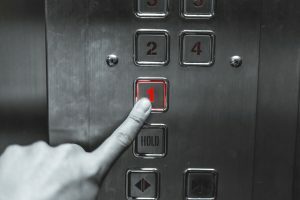 While these types of scenarios can, and do, cause serious injuries, they are not the only kind of elevator incidents that can lead to injuries for which you may be entitled to compensation. If you’ve been hurt in an elevator accident, even if there was no malfunction of the elevator car’s movement at all, you should consult a knowledgeable Louisiana injury attorney about your options. A very recent lawsuit filing from out of state, reported upon by the Penn Record, is an example of this type of accident. A.T. was a hospital worker whose duties included, among other things, moving a food cart from place to place. One day, as A.T. was trying to move the cart into or out of the elevator, the cart allegedly got stuck in the gap between the elevator car and the basement floor. When cart got stuck, the unexpected and sudden stoppage caused the worker to suffer substantial injuries, including physical pain and suffering, as well as mental anguish, according to A.T. While you may not necessarily realize it, any elevator accident has the potential to be massively harmful. A fall of just a few floors can be extremely dangerous and damaging, especially if your accident involves an elevator stopped by an impact with the ground. The sudden stop can exert a profound jolt on your body. This can cause serious damage to feet, ankles, legs, knees, hips and your back. These injuries can include both broken bones and soft tissue damage. Regardless of how far you fell, you should take timely action to protect your rights and your ability to recover compensation for the harm you suffered. Reach out to put an experienced New Orleans injury attorney on your side. One recent elevator accident case originated in the state’s capital. G.T. worked for the state’s Department of Health and Hospitals at the Bienville Building in downtown Baton Rouge. One day in early 2011, G.T. left his eighth-floor office at the end of the work day and took the elevator down, as usual. The trip was far from typical, however. As the elevator reached the third floor, it fell suddenly, plummeting all the way to the ground floor. The powerful impact caused G.T. to suffer serious injuries to his spine, hip and both knees. The injury forced the worker to undergo a bilateral knee arthroscopy. He also eventually needed multiple lumbar fusion surgeries to address his spinal injuries. If you are injured in an elevator accident, you may be entitled to compensation for the harm you suffered. The correct avenue for seeking that compensation may vary based upon the facts of your case. In G.T.’s situation, because the elevator accident that injured him occurred in the office building in which he worked, he was able to pursue, and obtain, compensation in the form of workers’ compensation benefits. A recent report of an elevator accident and the lawsuit it triggered is a reminder that elevator accidents can be seriously harmful events for those involved, and they can lead to a wide array of harms suffered by that person (or people). When those injuries are results of an improperly maintained elevator (or some other form of negligence by the owner), those injured may have a case for compensation. If you’ve been hurt in an elevator accident, be sure to contact a skilled New Orleans elevator accident attorney right away to discuss your options. The recent report, published in the Louisiana Record, detailed the elevator accident of a woman named Nekita. Nekita was riding in a parking facility elevator in Downtown New Orleans when the elevator allegedly malfunctioned. According to the woman’s lawsuit, the elevator car began to shake and to move up and down in an abnormal fashion. During the entire period of malfunctioning, Nekita was trapped in the elevator car and unable to leave, according to her lawsuit.